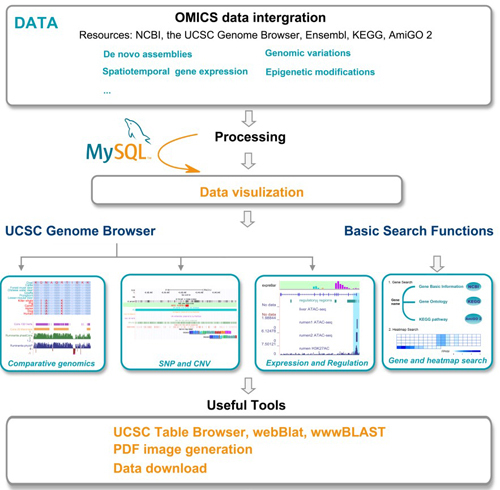 The omics data (including de novo assemblies, genomic variations, spatiotemporal gene expression, epigenetic modifications, etc.) for many livestock and poultry species is growing exponentially. However, the lack of proper integration present an obstacle to in-depth exploration and interpretation of these massive data. We are aimed to integrate available omics data for domestic animals and build user friendly web interface for scientific communities to use. The pan-genome is supposed to contain the 'whole' genomic contents of one species and thus is merging as an alternate to the current reference genomes. We are working hard to construct pan-genomes for major domestic species including goat, sheep, pig, cattle, chicken and duck. The final pan-genome for each species will serve as a comprehensive repertoire for the reference genome sequences, gene annotations, genomic variations (SNPs, Indels, CNVRs), expressions, etc. This database contains whole genome alignments of 54 ruminants and 13 mammals, five scales of conservative evaluation, abundant RNA-seq data, as well as regulatory regions predicted by utilizing four ruminants and multiple human epigenetics data. This site is designed to work with IE 9 and above, Firefox, Chrome, Safari and Opera. If you need some help, feel free to contact us.